That is how many members of St. Paul Parish in Tell City described the Oct. 19 appointment of their pastor and a son of the parish, Father Paul D. Etienne, as the new bishop of Cheyenne, Wyo. Joan Conner, 78, and her husband, Bill, have been close friends of the Etienne family for 50 years. They witnessed the 1992 priestly ordination of Bishop-designate Etienne, the ordinations of two of his brothers, Fathers Bernard and Zachary Etienne, who are priests for the Evansville Diocese, and the solemn profession of monastic vows of his sister, Benedictine Sister Mary Nicolette Etienne. “It was a wonderful day. We were so thrilled to hear it,” said Conner of the occasion earlier this year when she learned of then-Father Etienne’s appointment as her pastor. “And then it was a very emotional day when we found out that he was going to be leaving us to be a bishop,” she said. “It was mixed emotions: happy for him, but sad for us. Joseph LeClere, 59, is a member of St. Paul Parish who has researched its history. He is also a first cousin of Bishop-designate Etienne. 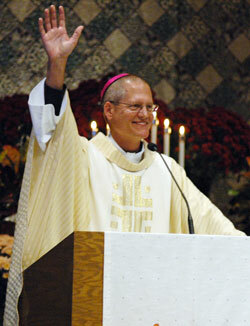 He called the episcopal appointment of their pastor “a tremendous honor” for St. Paul Parish. When he first learned of the appointment, LeClere said he was not so positive. He was frustrated that he was losing a good pastor so soon after he began his ministry at the parish. A day later, though, LeClere started to gain a broader perspective on this history-making event for the parish. While Conner watched Bishop-designate Etienne grow up, and LeClere grew up with him, Chris Hollinden, 27, is of a more recent generation, one that was formed in the faith at St. Paul Parish in much the same way that Bishop-designate Etienne was. “He went to the same elementary school that I and all of my friends went to,” Hollinden said. “He had the same upbringing as all of us. He’s from our area. He knows all of us. He’s just like one of us. Bishop-designate Etienne acknowledged the key role that St. Paul Parish played in his formative years in an interview with The Criterion four days before his episcopal appointment was made public. “I remember all the sacraments, except for baptism, obviously, and the celebrations that were a part of that, the people that were a part of that,” he said. “It was here where that call to the priesthood surfaced for me. So many people of this parish invited me to consider that when I was working here in town after high school.